Ukrainian Security Service officers detain former Georgian president Mikheil Saakashvili at the entrance of his apartment building in Kyiv, Ukraine, Dec. 5, 2017. High drama degenerated into farce with the attempted arrest of Mikheil Saakashvili by Ukrainian authorities on Tuesday, leaving international experts puzzled about the motives behind the move but in agreement on one point—the mishandled operation has so far served mainly to tarnish the image of Ukraine's government. Television cameras captured most of the action as riot-clad security forces dragged the one-time president of Georgia from his Kyiv apartment to a waiting police van, only to be blocked by a mob of Saakashvili supporters who eventually helped him escape from the van. The Georgian firebrand-turned-Ukrainian opposition leader then led the crowd on a march to parliament while denouncing his former friend and ally, Ukrainian President Petro Poroshenko. The failed arrest stemmed from charges filed by Ukrainian Prosecutor General Yuriy Lutsenko, who alleges that Saakashvili financed opposition political activities by conspiring with fugitive Ukrainian oligarch Serhiy Kurchenko—an ally of the ousted former president Viktor Yanukovych, who now lives in self-imposed exile in Russia. Saakashvili calls the charges a politically motivated fabrication to keep him from seeking public office in Ukraine. Addressing a panel of regional experts at the Washington-based CATO Institute via Skype from an undisclosed location on Wednesday, Saakashvili denied ever having been in contact with Kurchenko. "I don't know who Kurchenko is, I never met him," he said. "I mean, I've heard that he exists, but I never met him." Adrian Karatnycky, a nonresident senior fellow with the Atlantic Council's Dinu Patriciu Eurasia Center, told VOA's Ukrainian Service the charges against Saakashvili amount to "either the largest libel in Ukraine’s history—dwarfing the spurious charges pressed against [former Ukrainian prime minister Yulia] Tymoshenko by Yanukovych—or Saakashvili has yielded to the temptation to raise funding for the revolution by falling prey to his own thirst for power and political influence." Although Saakashvili is a self-declared enemy of Russia, he may not be an enemy of Russian financing, Karatnycky suggested. "He could have easily thought that he is able to cautiously use Moscow funding in his own interests," Karatnycky said. "No one is saying that Russia would be trying to support Saakashvili. This could have been Russian influence agents destabilizing the situation in Ukraine. Georgian former President Mikheil Saakashvili flashes a victory sign after he was freed by his supporters in Kyiv, Ukraine, Dec. 5, 2017. Saakashvili, the hero of Georgia's "Rose Revolution," led demonstrators to storm the Georgian parliament in 2003, ending the post-Soviet rule in Tbilisi of one-time Soviet foreign minister Eduard Shevardnadze. For years he was welcomed in Washington as a hero of Western-style democracy. After introducing sweeping reforms to reduce official corruption, his rule became tainted by allegations of increasing authoritarianism. The 2008 routing of Georgian forces in the country's South Ossetia and Abkhazia regions by Russian troops prompted a steady decline in Saakashvili's popularity. By the end of his second and last term in office, his party had lost control of parliament, and soon afterward he left the country in the face of what he dismisses as trumped-up criminal charges. To the rescue came his old friend Poroshenko, who provided him not only a Ukrainian passport but also a post as governor of the southwestern region of Odessa. Looking to burnish his own reformist credentials in Ukraine's post-Euromaidan upheaval, Poroshenko placed Saakashvili, along with a handful of ex-Georgian democratic revolutionaries, in Ukrainian government sectors tainted by graft. But Saakashvili gradually fell out with Kyiv’s leadership, leading him to resign the governorship and announce the formation of a new political movement last fall. Although the source of funding for Saakashvili's movement has not been clear, Karatnycky says the lack of financial transparency is typical for Ukrainian political parties of all stripes. Police use tear gas as they clash with supporters of former Georgian president Mikheil Saakashvili in Kyiv, Ukraine, Dec. 5, 2017. "For years we have been saying that the funding sources for Saakashvili’s political activities are unknown," said Karatnycky. "Despite that, there is [a broader] lack of attention to transparency. No one attempted to audit his operations. How much have the protest actions cost? Offices? Staff? Busing participants? If there were a more balanced and thorough monitoring of the authors of radical anti-corruption slogans, there would have been less space for a rigged game." If it can be proven Saakashvili conspired with Russian interests, Karatnycky said, it would bolster Poroshenko's claims of rampant Russian meddling in Ukraine's domestic politics. If, however, the charges cannot be proven, the botched arrest and unproven charges may exacerbate political infighting and dueling accusations of political corruption. Neither outcome, he added, bodes well for Ukraine. “I think that we can see the crisis of trust not only on behalf of the society, but also on behalf of the Western countries, which would want to see Ukrainian people quickly issue new governance mandates for the country,” Karatnycky said. Taking to Twitter Tuesday morning, Carl Bildt, a former Swedish prime minister who co-chairs the European Council on Foreign Relations, was more succinct. 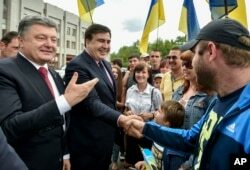 Seen during better times, Ukrainian President Petro Poroshenko, left, and then newly-appointed Odesa region governor Mikheil Saakashvili, second left, shake hands with local residents, in Odesa, Ukraine, May 30, 2015. Economist Anders Aslund of the Washington-based Atlantic Council said the eruption of protests following Saakashvili’s arrest indicate growing distrust of Ukrainian law enforcement. "The SBU [security service] and the prosecutor general’s office are seen as the most unlawful corporate raiders by active Ukrainians," he told VOA. "The clumsy attempt to arrest Saakashvili was seen by many as an attempt to use law enforcement to reduce political freedom. "The big civil society disappointment has been that the judicial reform has failed as 25 of the 113 new Supreme Court judges were verified as corrupt," he said. "In the last two weeks the SBU and the general prosecutor have pursued a lawless campaign against the new Anticorruption Bureau, which has aroused suspicions that the government wants to eliminate it." State Department spokesperson Heather Nauert said U.S. officials are monitoring the situation in Kyiv closely. “As you know we have a good relationship with the government of Ukraine, but it doesn’t mean that we agree with them on absolutely everything," she said during a press briefing in which she urged Kyiv officials to deescalate tensions and called on all sides to avoid violence and honor international commitments. She referred all further details of Saakashvili's case to the government of Ukraine. This story originated in VOA's Ukrainian Service. Ia Meurmishvili of VOA's Georgian Service contributed original reporting.